Custom metal wine racks are uniquely designed in various sizes, shapes, finishes, to match your specifications and decor. Perfect gifts for house warming, wedding or any occasion. Our metal wine racks are for everyone who loves to display their finest wines. Wine stored in a wine rack can age slowly and safely and our we design each piece to ensure the cork stays wet allowing the wine to mature. Woodman Metal Creative Designs can custom design any piece to match your decor. 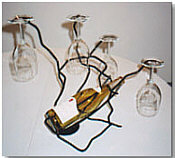 Some designs can include decorative metal leaves and grape clusters, mirrors, holders for glasses and shelving. We've added a new dimension in which the look of roots or vines move around the bottle, proceeding up to hold glasses. The desired end result in creating these beautiful pieces was to design an original rack that would hold the bottles in the recommended tipped down position and have an organic look. We have aimed to create a superb range of custom designed metal wine racks at surprisingly affordable prices. The pieces shown here are just a small sampling of what we have created and in no way limit the possibilities. If you are interested in any of our custom designed metal wine racks, please email the measurements you will need. I will need to know how many bottles of wine you will be storing, if you'd like your glasses to hang from the wine rack. 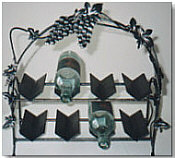 For a larger, dramatic wine rack, we made this piece to hold wine glasses, bottles and accessories. Since each piece is designed to fit your specific needs I need to know if you are looking for your wine cellar, table top, floor stand, retail store, etc. Please email any pertinent information and we can design a unique metal wine rack for you.